For Senior Constable Deena White, who wanted a long-term career with challenges and variety, Tasmania Police offered everything she was looking for. “It appealed to me to work in a job where you could change roles, be out and about and challenged, and policing really ticks all the boxes for me,” said Deena. Trained in Disaster Victim Identification (DVI), Deena is a specialist in identifying persons of unknown or questioned identity and assisting with the repatriation of deceased persons back to their families. “I am very passionate about forensic identification and knowing that my work really makes a difference in helping the family and friends of a deceased person is important to me,” she said. Utilising her specialist skills, Deena assisted with the identification process following the Thailand Boxing Day tsunami and Victorian bushfires in 2009, and says it’s about finding a positive while working in the midst of a disaster. “Following the Thailand tsunami, working in an open air mortuary inside a Thai temple (referred to as a Watt) near a local village was an environment I had never worked in before,” she said. “While conducting autopsies on a multitude of deceased we had a variety a feathered and four-legged friends who often sauntered casually through the site. “One robust looking rooster would often strut through the grounds conducting a variety of roles, most notably cleaning up the insects and maggots which had been left behind after the deceased had been removed. “The rooster was a regular on the site who we grew quite fond of in the midst of the trauma, until one day he was nowhere to be seen. “When I asked one of the locals where he was they told me they ate him the previous night for dinner, and I didn’t quite have the heart or stomach to tell them,” she said. Deena encourages other members to consider DVI work. “Have a strong stomach, be prepared to work hard and always remember that you are not an island but part of a team. “Don’t go into DVI work looking for the accolades or awards but have a genuine passion for forensic work and a desire to assist others. “A body in a bag may only have a number on it but it is still has a human inside who was once a living, breathing person who has people left behind who want to know what happened to them,” she said. Above left: Thailand Boxing Day tsunami response, Senior Constable Deena White (centre) with members of the Thai DVI team. 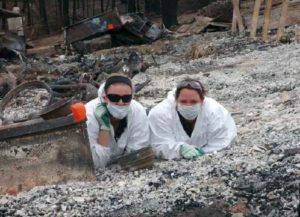 Above right: Below During the 2009 Victorian Bushfire response, Senior Constable Deena White (left) and Constable Kyleigh Perkins (right). This page -- https://www.police.tas.gov.au/about-us/100-years-women-policing-tasmania-police/women-specialist-roles/making-difference-helping-identify-unknown-deceased/ -- was last published on February 13, 2018 by the Department of Police, Fire and Emergency Management.